Date/Time: Monday, December 7, 2015 at 10:45 a.m.
We are making a very big push to contact and invite as many Pearl Harbor & WWII survivors that we can find in the Snohomish County area, so if you know anyone that we can contact please let us know. We also would like to have more family members of survivors join us as well. Program: The Year’s program is sure to be something special as we are going to add more pieces to the ceremony. We will have a featured guest speakers, wreath dedication, historical background of “Sound the Alarm” and a special “Salute to our guests from Pearl Harbor and WWII” We will need to know those from this era who are attending so we can ensure they are seated for this honor. Following the ceremony we will invite everyone to come and join us for lunch at the All American. Lunch is $6.95 per person. Military Uniform: Service Dress Blue (ceremony participants) or Uniform of the Day (military guests). For military retirees, Service Dress as appropriate/permitted. If you have not attended an event here previously please provide your Full name, Driver’s license State/Number and date of birth if you do not have base access credentials, such as military I.D. The VUMS organization started in 1991 to honor those proud Americans who entered military service to their country under age. VUMS enlisted under age 17 for men and under the age of 20 for women during WWII, The Korean War, and beyond. More than 20,000 VUMS served in the U.S. Armed Forces. Only about 2,900 are left. We are losing about 600 per year making our longevity very short. You can go to oldvums.org to find out more. 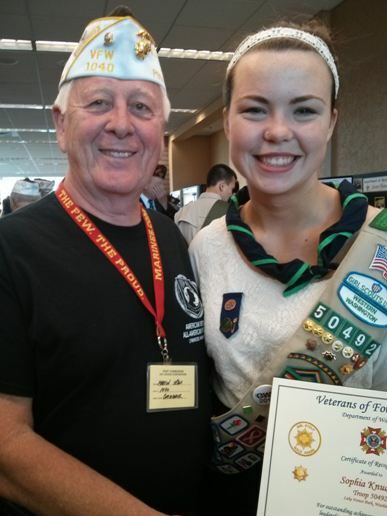 Congratulations to Sophie Knudson, who has been selected as the VFW Department of Washington’s Scout of the Year. Sophie is sponsored by VFW Post 1040. Please meet at 11:00 a.m. on July 4th at the corner of 6th and Bell in Edmonds to march in this year’s Fourth Of July Parade. Be sure to wear your VFW cover and your black POW t-shirt (or any VFW shirt). The picnic this year is hosted by VFW Post 8870 and American Legion Post 66, and will be at the Edmonds City Park, Shelter 2, from noon till 3:00 p.m., on July 5th. BSA Troop 49 and VFW Post 1040 will dedicate the new Korean War Memorial at Lynnwood Veterans Park at 3:00 p.m. on Wednesday, June 25th. All are invited to attend.